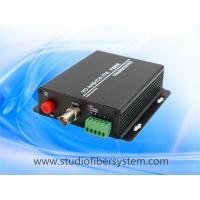 1CH AHD Fiber converter also named as 1CH AHD fiber transmitter and receiver,which is an universal type supporting 1MP/1.3MP/2MP/3MP/4MP/5MP TVI / CVI / AHD over a single fiber optical fiber , to achieve megapixels level analog HD video point to point highly and reliably transmission over one core multimode or single-mode optical fiber without delay. It also supports the regular analog video format such as PAL / NTSC /SECAM , it is a kind of universal fiber transmission solution for CCTV analog video and data signals . This equipments are available for either standalone or rack-mount installation, which is suitable for different working environment . Electronic and optical adjustments are never required. LED indicators are provided for instantly monitoring system status. 5, single fiber transmission, optional 20KM, 40KM, 60KM, 80KM, 100KM long-distance transmission. The interfaces on the rear panel are: grounding holes for connecting and releasing ground to achieve better lightning protection and anti-static effects; and a power interface for connecting an external power adapter.